With thousands of lakes, countless islands, and spectacular scenery, there is no lack of incredible boat cruises in Ontario. 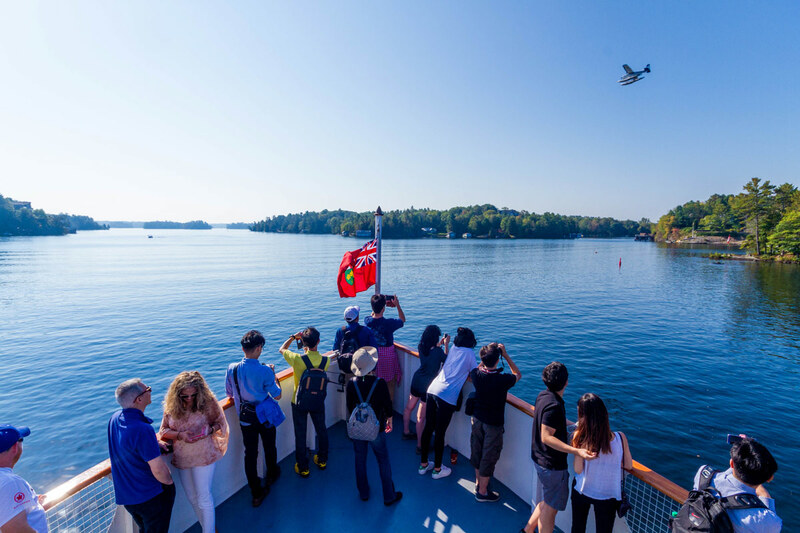 But with the special combination of breathtaking Muskoka scenery, incredible history, and personal service, the Lake Muskoka Steamship Cruise company has crafted a unique experience that visitors to the region won’t soon forget. In fact, it may be one of the coolest Lake Muskoka cruises currently running. Muskoka is approximately a 2-hour drive from Toronto making it a favorite family destination for a weekend getaway. But where should you go? At 6,475 km2 Muskoka covers a huge municipality of north-central Ontario. The Muskoka region extends from Georgian Bay in the west to the northern tip of Lake Couchiching in the south, to the western border of Algonquin Provincial Park in the east. For our latest adventure, we decided to experience Muskoka boat cruises via a Lake Muskoka Steamship. Fittingly, Muskoka Wharf is in Gravenhurst, Ontario, which is considered the gateway to Muskoka region. Muskoka Steamships has a fleet of 2 cruise ships. These gorgeous antique and antique-style boats ply the waters of Lake Muskoka from their home dock of Gravenhurst, Ontario. The Muskoka Steamship boats are the RMS Segwun and the Wenonah II. A third cruise ship, the Wanda III, is planned to join the fleet. The Wanda III is currently under renovation and can be found in storage near the docks by the Muskoka Discovery Center. The RMS Segwun cruise steamship is a true piece of classic Canadian history. The letters RMS stand for Royal Mail Steamship. The RMS Segwun is North America’s oldest operating mail steamship. At 130 years-old, this ship has been around almost as long as Canada has! Although the RMS Segwun is now in use as a Muskoka cruise ship, it is still possible to send mail from the ship. That mail is stamped and posted as originating from the RMS Segwun. Unlike more modern the boats for more modern Muskoka boat cruises, like the Lady Muskoka, the Segwun in all about the history! A tour or the RMS Segwun is like a blast from the past. The engine room is laced with the original brass decor. And the throttle control is a bold statement to the Muskoka steamship’s vintage heritage. Something very cool about the Segwun steamship is that it was originally a side paddlewheel steamer. The original name of the Segwun was the Nipissing II. 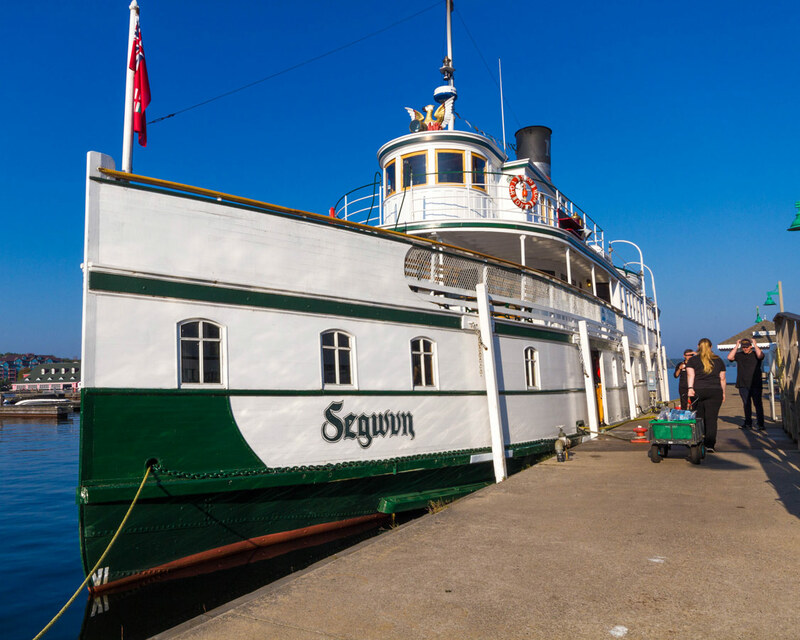 The steamship was updated with propellers, and relaunched with the Ojibwa name Segwun, meaning “springtime, in 1925. The ship we would be taking on our Muskoka Lake cruise was the Wenonah II. The Wenonah II is a modern interpretation of the traditional steamship, RMS Sagano. This diesel powered ship was named in honor of Wenonah, the first steamship to sail Lake Muskoka in 1866. And it’s obvious from first glance that a tremendous amount of work went into ensuring an authentic steamship feel for this boat. From bow to stern the Wenona II cruise ship looks and feels just like an old steamer. They even replicated the steam horn sound when the Wenonah II blasts its horn! The Wenonah II cruise ship has a capacity of 216 individuals. It has modern conveniences such as air-conditioning and even an elevator. It has 3 dining rooms and 3 decks. And there is also lots of covered seating so cruises run rain or shine. 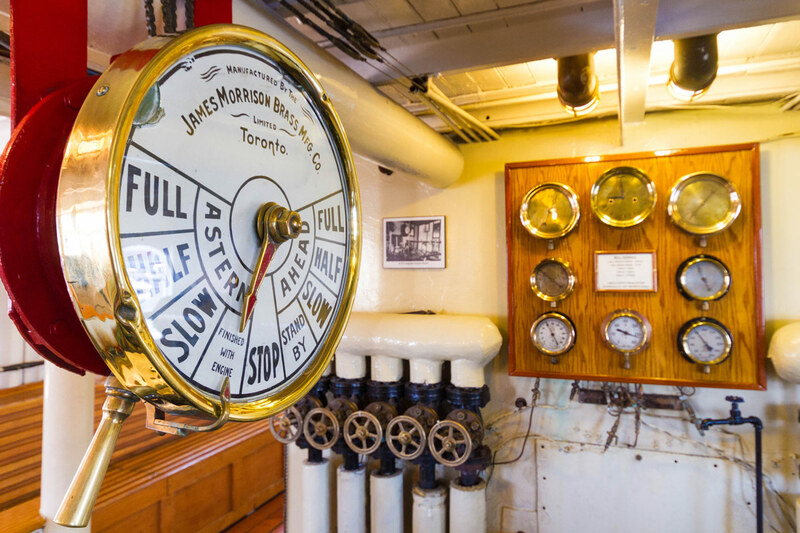 What makes the Wenonah II cruise ship so special is the incredible attention to detail that Muskoka Steamships went through to replicate a true steamship experience on a ship with a diesel engine. Which Lake Muskoka Steamship Cruise Should you Book? The Muskoka Lake cruise season starts in June and goes until October. Start and end dates vary with the weather so it is best to check their website for up to date schedule information. 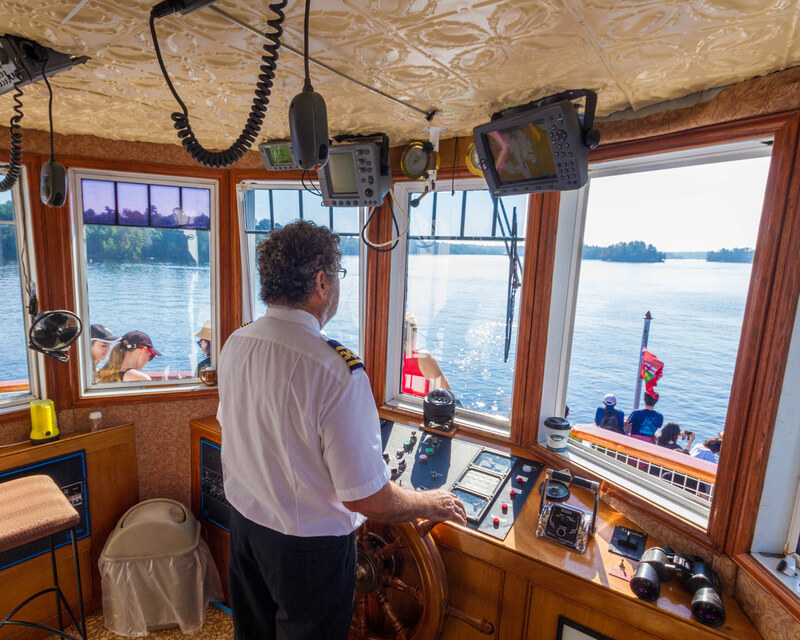 Muskoka Steamships offers five different cruises ranging in length from 1 to 4 hours. The variety of cruises ensures that there is a cruise that can work with nearly every schedule. Even if you are only visiting for a day trip to Muskoka. If you end up in Muskoka during the Canadian Thanksgiving weekend, make sure you head to nearby Bala, Ontario for the famous Bala Cranberry Festival. 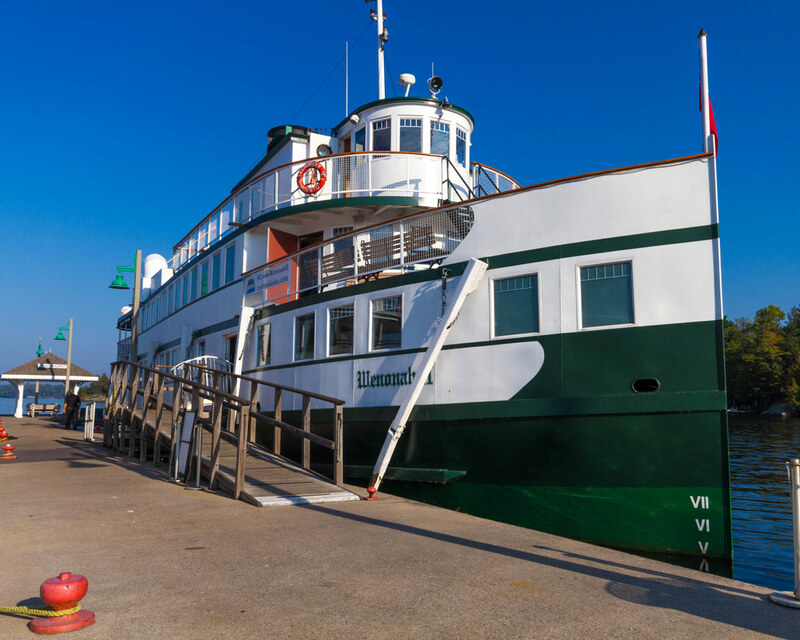 You can also experience other Muskoka cruises such as the Island Queen, which takes a scenic route into beautiful Georgian Bay and the Lady Muskoka cruise which explores some of the rivers that lead into gorgeous Lake Muskoka. For those that are short on time, the 1-hour cruise would be the perfect option. For those that want to experience High Tea while also enjoying the gorgeous views of Lake Muskoka, the 2 and 4-hour cruise options are for you. Both the 2.5 and 3.5 hour Muskoka cruises have meals available as an optional add-on. The two-course lunch is available on the 2.5-hour cruise while the three-course dinner is available on the 3.5-hour cruise. In both cases, you must pre-order the meal when you book your ticket. Besides the regularly scheduled cruises, there are also several themed cruises that run throughout the cruising season. These may include Muskoka sunset cruises or holiday cruises such as the Thanksgiving Day Cruise. 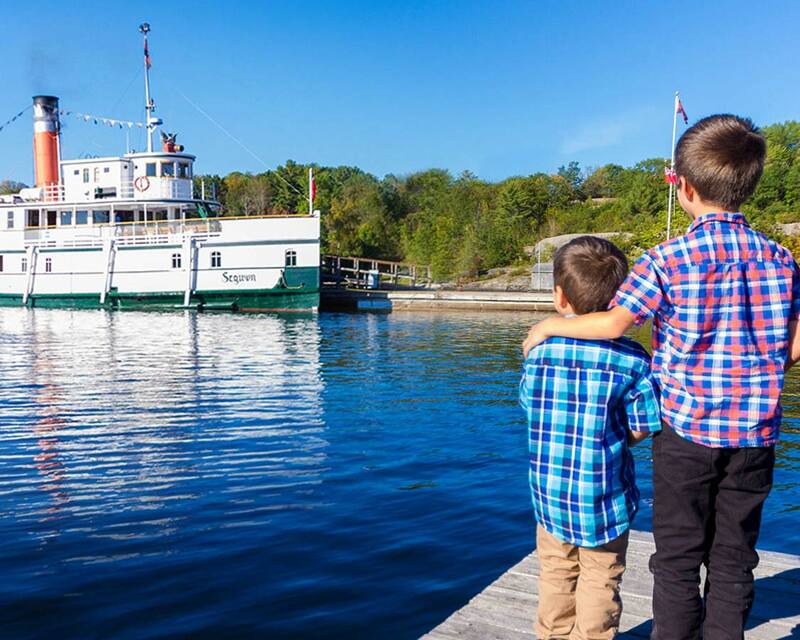 One of our favorite things about the Muskoka Steamship cruise experiences though is that they also have cruises specifically designed for kids. We cannot wait to go back in the summer to take part in the Muskoka Steamship Pirate Cruise. A two-hour cruise is an interactive event that encourages all participants to come dressed in their best pirate gear. Best of all, even the local residents on the surrounding islands participate in the fun! What Will I See on a Lake Muskoka Steamship Cruise? All Muskoka Steamship cruises embark and disembark from the Muskoka Wharf in Gravenhurst, Ontario. During the summer, the Lake Muskoka cruise is a great way to enjoy the sunshine and see the Muskoka waters teaming with residents. Summer is when cottage country comes to life, and Muskoka is the heart of the action! 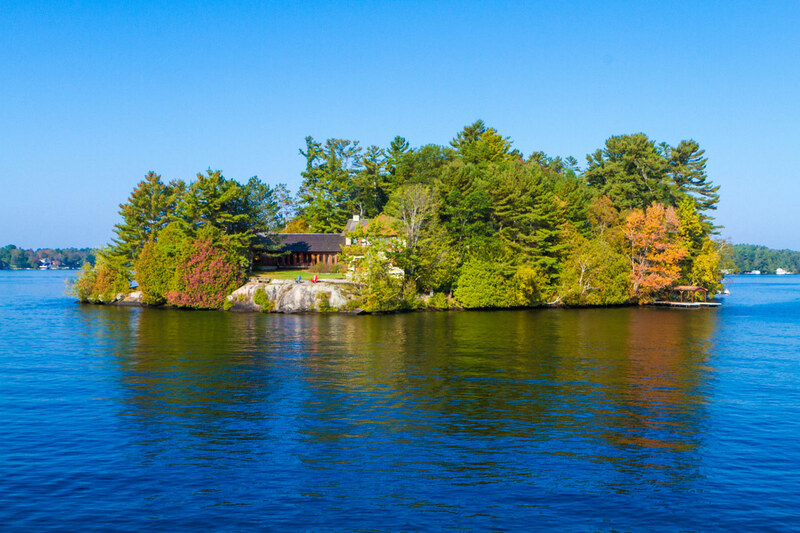 As summer makes way to fall, the Lake Muskoka Steamship cruises provide a great perspective from which to oohh and ahh at the famed fall colors in the Muskoka region. The exact cruise path changes but you are sure to see many of the islands and Lake Muskoka’s shoreline. You can read about some of our other favorite fall activities in Ontario here. Our ride on the Wenonah II provided a fantastic view of Muskoka’s shoreline and its many islands. 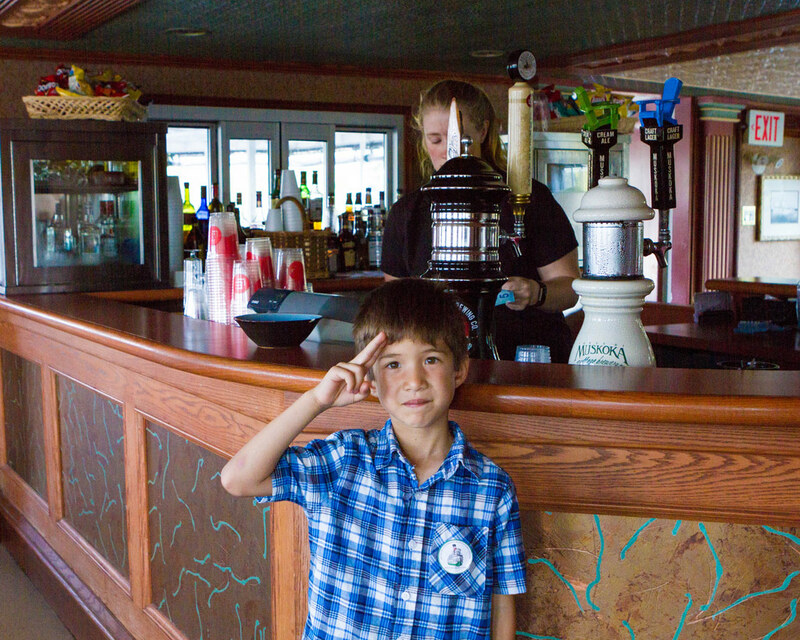 The ship’s Captain served a second duty as the cruise narrator. He spun tales about the history of the region. Our boys were fascinated by the stories of pirates and shipwrecks told along the way. Though it was still early in the season, I could definitely see why going on a Muskoka Fall colors cruise is a recommended experience. Many maple trees had leaves which were starting to turn their bright red colors. We also spotted some yellow leaves on a few poplars. In a few weeks time, the area will be full of color. And a great contrast to the deep blue waters of Lake Muskoka. One for the most famous spots on the tour is the Gravenhurst Narrows. On the lake side of the Gravenhurst Narrows is the Gravenhurst Narrows Lighthouse. Unfortunately for us, the lighthouse was under construction so we got to see a light tower in its place instead. There is a lot more to enjoy in Gravenhurst, Ontario. So, if you have time, why not explore what the town has to offer before or after your Lake Muskoka Steamship cruise. Gull Lake Rotary Park is a fantastic spot to have a picnic while waiting for the sun to set over Lake Muskoka. Or get your face messy with some ice cream while walking the length of the Gravenhurst boardwalk. 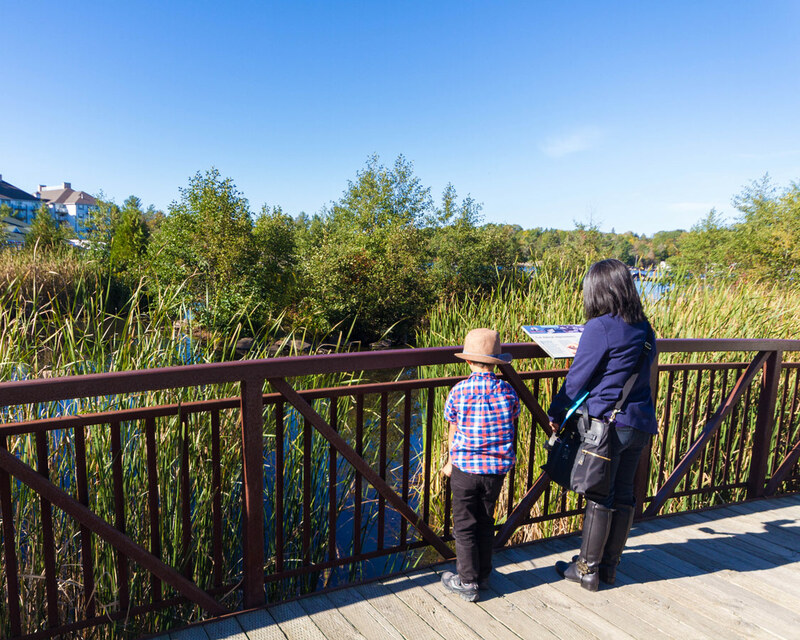 One of our favorite stops was definitely the nearby Muskoka Discovery Centre. The area around the boardwalk has lots of shops to explore. You can even rent boats and jet skis if you feel inspired to hit the water by yourself! 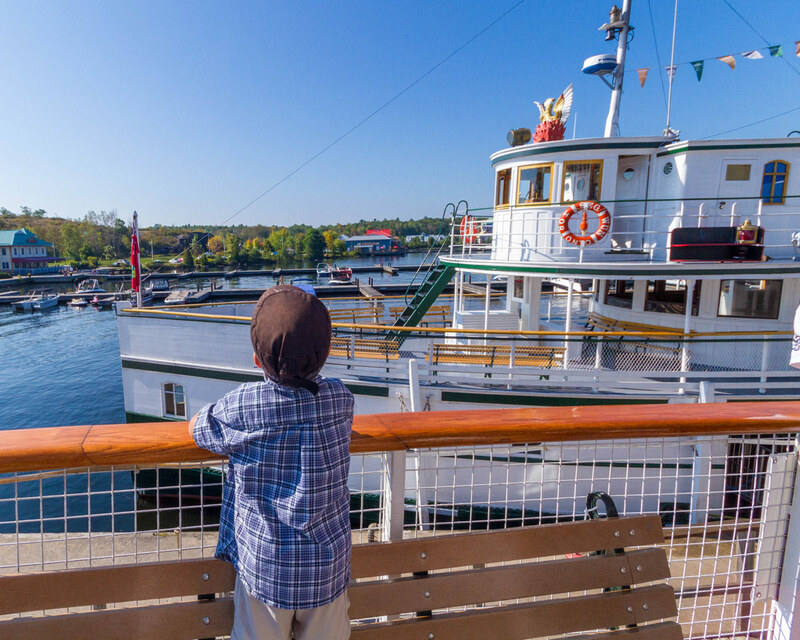 All Muskoka Steamship Cruise tickets come with a bonus, a ticket to the Muskoka Discovery Centre. The ticket is valid for any day. And if you are local to Muskoka, Ontario or surrounding regions, you may choose to visit the Muskoka Discovery Centre at any time of year as it is open year round. 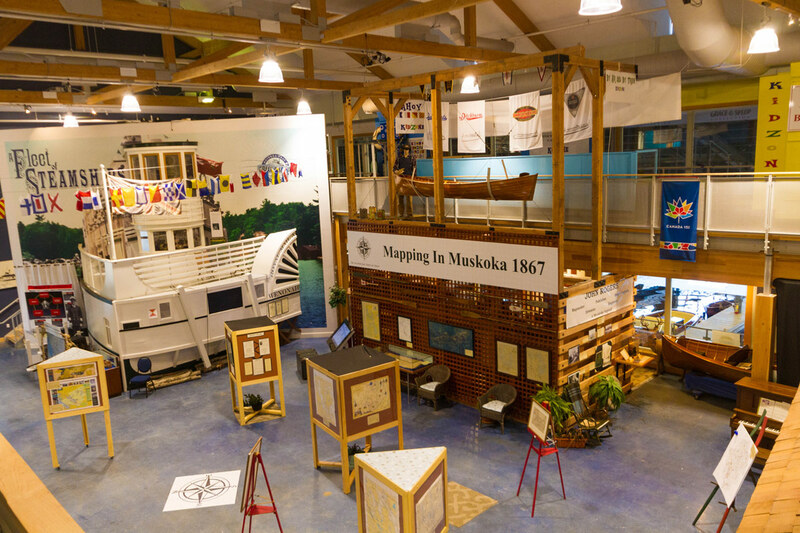 The Muskoka Discover Center is a fun place to learn more about the incredible nautical history of Canada. The Discover Center in Muskoka houses an incredible collection of old wooden motor boats. It also offers amazing information on steamships. 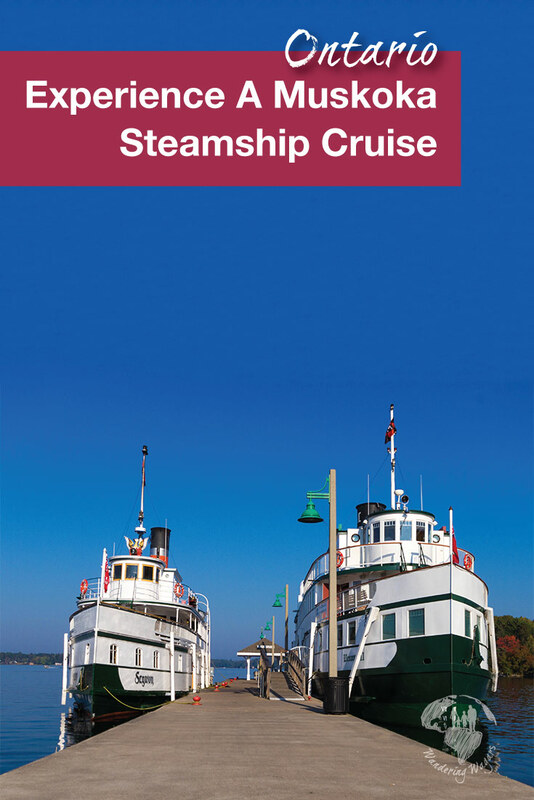 And it provides an overview of the history of shipping in the Muskoka region. Additionally, the Muskoka Discovery Center features a tremendous amount of activities and displays focused on children. The Muskoka Discover Centre is very family-friendly. 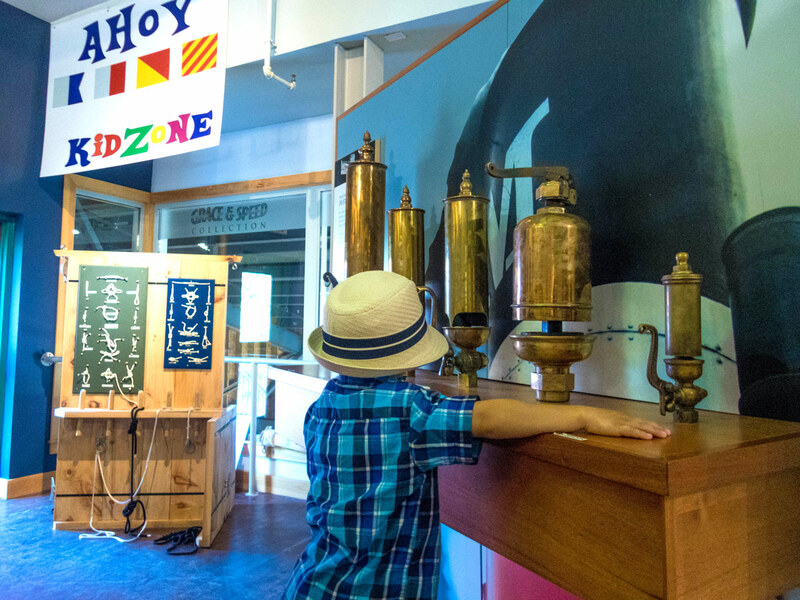 The Muskoka museum has an amazing KidZone equipped with lots of hands-on exhibits. The boys enjoyed playing hanging out at the Rotary Reading Treehouse and drawing pictures on the giant chalkboard that occupied one wall of one of the hallways on the second floor. There was also lego, steam whistles, and even a flight simulator to practice landing a float plane! For those who travel with toddlers and babies, there is the Tiny Tot Play Centre. The space is separate from the rest of the KidZone. This allows younger ones a safe place to crawl and play. Also, the Tiny Tot Play Center is still within the KidZone though, so parents can still see their other children even if they are within the confines of the Tiny Tot Play Centre. 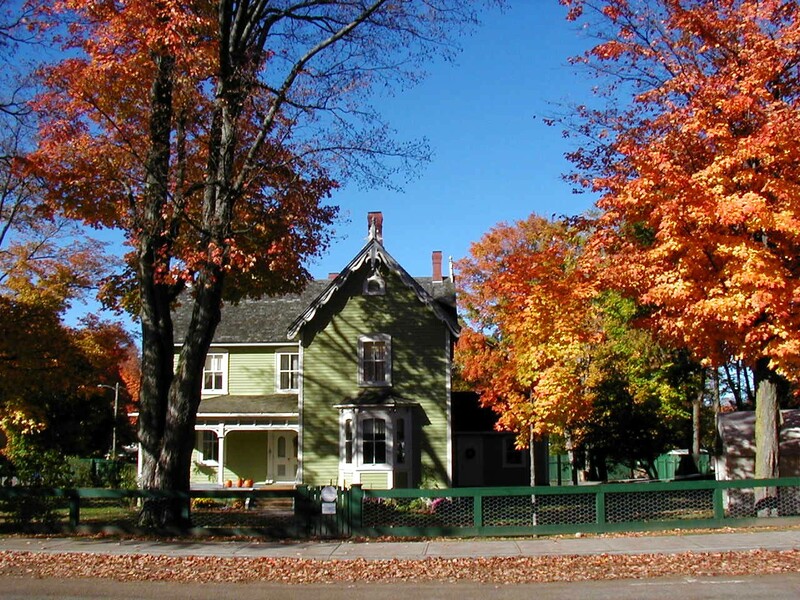 For those who stay in Gravenhurst for a couple of days or more, the Bethune Memorial House National Historic Site is another popular and educational attraction in Gravenhurst. The Bethune Memorial House is the birthplace of Dr. Norman Bethune. Dr. Bethune was a pioneer in the development of blood transfusions and a strong advocate for Canada’s national health care system. It is incredibly popular with visitors to the area. Because of Gravenhurst’s position as the gateway to Muskoka, there are a number of amazing resorts and bed and breakfasts to choose from. Some of our favorites include Taboo Resort and the Trillium Resort and Spa. But there is no lack of options in the region. You can check the prices and availability of hotels near Gravenhurst here. There is no doubt that we consider a Muskoka steamship cruise to be one of the best boat cruises in Ontario. It’s unique combination of history, class, and beautiful views is hard to beat. But no matter where you choose to stay in Gravenhurst, or whether you just make it a day trip to Muskoka, you are bound to be dazzled by the scenery. Have you ever taken a Lake Muskoka cruise? Tell us about it in the comments. Or send us an email from our contact page! Let us know if we missed any amazing things to do in Gravenhurst, Ontario. Disclosure: We were guests of Lady Muskoka for this cruise. As always, our views remain our own. Wandering Wagars is a participant in the Amazon Services LLC Associates Program, an affiliate advertising program designed to provide a means for sites to earn advertising fees by advertising and linking to amazon.com, amazon.co.uk, amazon.ca. Amazon and the Amazon logo are trademarks of Amazon.com, Inc. or its affiliates. The Segwun Steamship looks like a gorgeous old boat that has been beautifully refurbished. As a true piece of classic Canadian history that royal mail steamship. I can see the pride in it as I look at the engine room with its high polished surfaces. The Wenonah looks just like the Segwun. What a lovely place to cruise! I have bookmarked this for when we get to Canada. Lake Muskoka looks so beautiful and charming. I think I would like the 3.5 hour cruise and enjoy a meal on the old steam boat. Why rush it right? The ships are in incredible shape! And great attention to detail in the interior makes the inside of the ship almost as stunning as the views outside. What a gorgeous old boat – and so beautifully refurbished. It must have been a fantastic experience to sail on her – like stepping back in time. Added to my Canada to do list! We did a wonderful self-drive around Toronto, Montreal, Ottawa last year, along the St Lawrence but we didn’t have enough time to head further north and your post makes me want to be sure we have time to do that next time. I love the historical design of these steamships and the idea of exploring the lake on these gorgeous vessels is very appealing. Enjoying tea or a meal on the cruise sounds perfect. I love old steamships with all the shiny brass fittings. Did the vintage throttle control resonate in a bell ringing from the engine room? I must say that I would have expected a little more attention to historical features when the bar area of the Wenonah II was refurbished. Muskoka sounds fascinating and I think it’s mostly because of the two steamship boats 🙂 RMS Segwun especially looks great…and I would love to do a cruise, and for all the 4 hours! Muskoka Discovery Centre would also be nice to visit…it’s really nice that they are open whole year round. Looks like you picked the perfect day for a cruise, weather-wise! The RMS Segwun looks fab – great capture of the details. And of course, fall colors ??? We are visiting family in Rochester for Christmas this year so I was fascinated by your posts.Thank you for the one about Niagra Falls too! Im not sure if the weather will be good enugh for the boat trip but it certainly looks beautiful. What a great idea to do a pirate-themed cruise. My kids would be in heaven! I imagine an October cruise would be lovely as well, with all the colors. Do the waters get warm enough to swim in during the summer? Wow. 130 years old is not joke. Just about as old as Canada, and a far portion of towns in my part of the world. Very neat. This is a great weekend activity a a lovely place to explore. Canada is on my list and hope to have the oportunity to visit it some day.